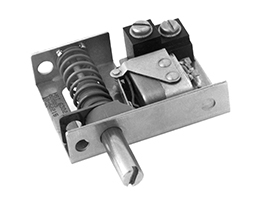 The INTERLOCK switch is a rugged pushbutton type switch used in heavy-duty applications. Haydon constructs this switch under rigorous quality specifications using high-tolerance materials that provide reliable performance even in harsh environments. The key component of this switch is the industry-proven electrical switching mechanism which is hermetically sealed in a highly protective assembly made of stainless steel. The Haydon Interlock switch also features a unique, flexible design which allows the operator to adjust the plunger to a specific switch activation point. With a 1/8” pre-travel - 1/2” total travel, the Interlock switch gives engineers flexibility, latitude and desirable mechanical options. The Haydon Interlock switch is available with various mounting configurations and a variety of contact ratings ranging from 5 amperes at 28 VDC to 10 milliamps at 30 mV. The switches are tested under severe conditions including humidity, moisture, rain, icing, high/low temperature, vibration and shock. Applications include heavy cargo doors used by aircraft, water or land transport vehicles and/or industries that require heavy-duty door or hatch switching capability. Sea Level to +50,000 ft (15 Km) Alt.